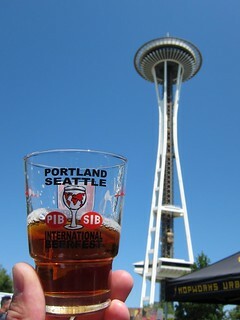 The Seattle International Beer Festival (SIB) will take place at the Seattle Center Fisher Lawn & Pavilion starting today through Sunday, July 7. While most beer festivals focus on local beers, SIB brings in some great beers from all over the world. They will have over 200 beers from 16 countries, both on draft and poured from bottles. There are always quite a few gems at this fest, and this year is no exception. You can check out the full list of beers here, and below I’ve picked out just a few beers worth targeting. Be careful; many of these beers are high alcohol and will catch up to you. I highly suggest taking public transportation, which shouldn’t be an issue due to its central location. Tickets are $25 online, or $30 at the gate (cash only) and include 10 beer tickets and a SIB glass. You can revisit all weekend without an additional entry cost. Beers will “cost” you between 1 and 7 tickets, depending on how expensive the particular beer was for the organizers to procure. There will be many bottled beers available that cost upwards of $20 or even $30 per bottle, and SIB is a great chance to try those without throwing down $ for a whole bottle. There are always plenty of interesting beers available for 1 ticket, so you can stick to those if you prefer. Big Al’s Jupiter’s Blood – This beer started out as a collaboration between Big Al and the now defunct Parati Craft Bar a few years ago. It’s a sour brewed with sangiovese grapes and aged for a year in just emptied sangiovese wine barrels from Walla Walla Vintners. It was good enough to win the silver medal in the Sour Beer category at the recent WA Beer Awards. Fremont Brewing Kentucky Dark Star – One of Washington’s best kept secrets. This bourbon barrel imperial oatmeal stout is up there in quality with any of the great stouts from around the country that get lauded on BeerAdvocate.com or RateBeer.com. Chuckanut Rauchbier – I’m not sure whether this is my favorite beer from Chuckanut, or their Pilsner, but either way I can’t pass up a glass of this traditional German-style smoked lager. Andechs Hefe-Weissbier – This is a great example of a German Hefeweizen. I’ll admit that I don’t drink imports very often these days, but with beers like this on draft at a festival it will be nice to revisit some. Lompoc Cellar D’or – I’m always up for trying out local NW versions of saisons/farmhouse ales. I’ve never seen this one before. Oakshire Reclamation Lager – I have really enjoyed pretty much everything I’ve had from Oakshire in the past, and I love a good Czech-style lager. Deschutes Black Butte XXV – Possibly the first place in Seattle to have the new release of this barrel-aged imperial porter on draft. I had a taste of it earlier this week and it is tasting great, as expected. Perfect Crime Smoking Gun – I’ll send you to this link to read more about who Perfect Crime is and this beer. I almost never throw down the big bucks required to buy a whole bottle of imports like these, so I need to make myself get some samples like this throughout the weekend.